If there’s one thing I’ve learned over the years - especially since starting my business 9 years ago, as a single parent with a 5 year old - it’s that there isn’t enough hours in the day and how I spend my time matters. Your time matters too. I get it. You’re busy preparing for baby or taking care of your new baby. You want to remember this moment in time but who actually has enough time to plan portrait sessions? There’s work and appointments, housework, things to buy, nursery to organize… You don’t want to have to email back and forth a hundred times, and have a bunch of meetings and phone calls, or decipher complicated packages and ordering processes just to have your baby photographed. This is the year everything changes. My life is easier. My clients’ lives are easier. ENTER ONLINE BOOKING! From start to finish, my entire process is streamlined. You can view my simple all-inclusive pricing and session info, book your session, pay your retainer, and sign your portrait agreement right from a single page. It really could not be easier. I designed everything to be automated so you can spend your time doing what you want (which I’m sure does not include wasting hours booking portrait sessions). But I’m here if you need me! Don’t hesitate to ask any questions you may have. Are you excited?! I sure am. I LOVE simplicity. If you’re expecting a baby and thinking about booking your newborn session, you can start HERE. I hope you enjoy my easy process. I can’t wait to work with you and meet your baby. Please feel free to leave a comment if you like the changes I’ve made. Curious what a full session with HHP looks like? I know it can be confusing when trying to choose the perfect photographer for your new baby. You want to ensure you capture his newness before he’s not a newborn anymore (believe me, the time will go FAST!). You probably aren’t really sure who will be able to capture and provide exactly what you’re looking for, or maybe you don’t even know what you’re looking for until you see it. Here is a sampling of my 3 packages so you can see what you’ll get with each session. Here, I show the different poses I typically achieve, along with the variety you can expect from your session. If you want a variety of flawless poses with classic and clean styling, then I’m your girl! Please feel free to ask me any questions you have. CONTACT ME for my pricing guide and online booking calendar. DELUXE session shown above. CLASSIC and SIMPLE sessions shown below (left to right). Boy & Girl Triplet Portrait Session! My second set of triplets came to the studio only a month after the first set! How crazy is that?! It has been the year of multiples for me. And I love it! I’m a huuuuuuuge sucker for a challenge. And photographing 3 newborn babies at the same time, well, it ain’t easy. Not even a little bit. BUT, pulling off a pose like the image above is literally the highlight of my life. I live for this. I crave it. I need to create. And the more difficult the baby(ies), the more exciting it is to capture the perfect pose! This session was actually my very first with my new amazing assistant. I actually can’t believe I went 8.5 years working alone during my sessions. Having help is a serious game changer. Not just for me, but for you (my clients) and your sweet new babes. There’s always someone right there for safety and comfort, a second set of eyes, and to help hold those tiny limbs in just the right place while I focus on capturing the shot, and my sessions run so much smoother now! It’s especially great having an assistant for sessions for multiples, since there always seems to be one baby who insists on doing things his or her own way. World, meet Luke, Jack, and Lily (left to right), and big sister Ava. They were all so beautiful and so sweet. And yes, I did have to give them back. I asked. Hard no. And how amazing are these colors mom let me use? Did you know that I offer an exclusive 10% discount for newborn multiples’ packages for TTMAC members? Now you do! My ‘Simple Sessions’ are perfect for those clients who want a few beautiful photos of their baby, but don’t need a full session with family posing. Simple newborn packages include just enough time, variety, and images at a lower price than my full session packages so you don’t have to sacrifice quality or pay for a whole bunch of images you don’t need. Packages include my time and talent photographing your baby, my amazing assistant to ensure baby’s comfort and safety, use of my studio collection of custom photography props and accessories, and a select number of digital images for $450+gst. Please contact me for more information about my packages and request my pricing guide. Here are some sample images of beautiful babies who had Simple Sessions! My first triplets visited the studio in August for their newborn photos. Three beautiful girls were perfectly posed together for a session styled in purple and neutral colors. Here’s a look at some before & after images from a newborn photography mentoring class with Hailey Hamilton Photography in Calgary AB. Her improvement is amazing! TTMAC members receive a 20% discount on newborn sessions for their multiples! Apply for one of four complimentary sessions per year! Newborn photography session with pet dog! Please inquire if you'd like your dog or other pet photographed with your new baby. Professional Calgary photo studio. 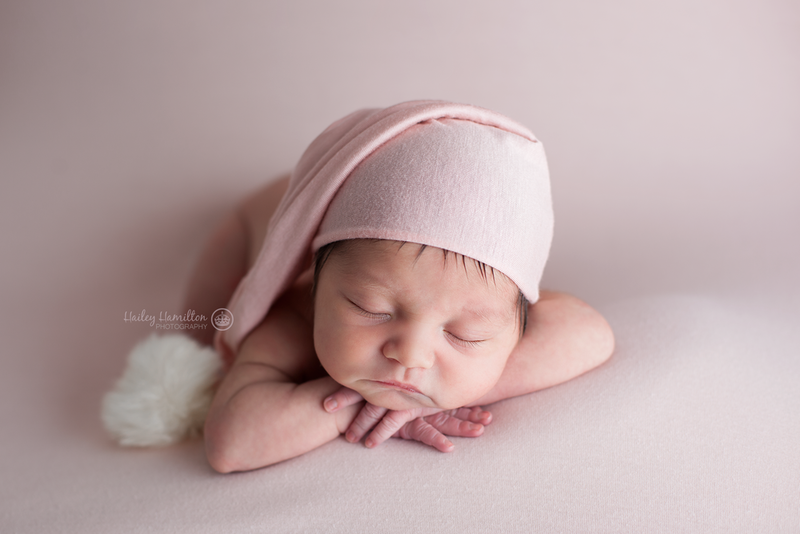 Posed, modern, simple newborn photography.